Maintaining and patching the E-Business Suite is faster when using the AD Merge Patch utility or admrgpch as the applmgr user, to merge patches. AD Merge Patch merges separate patches together, and the Patch Name stored in the database is “merged” and the patch driver is u_merged.drv. Merging patches avoids the duplication of effort, during the application of the merged patch, if multiple patches are trying to copy and generate the same file. The biggest time savings is the ability to recompile invalid objects only once, instead of once for each patch. The database stores information about the patch when each patch is applied. The patch name is usually the same as the patch number. However, for a merged patch, the patch name is “merged”. This makes it difficult to report the patches that have been applied to your instance. One approach is to keep the patches on the filesystem in a directory named after the patch session. Another approach to find all patches within a merged patch is to understand the tables that contain this information and the relationships between these tables. We can find all the bugs associated with a patch, even a merged patch. Problem: We need to find all the patches that were part of the merged patch. 295501 is the applied_patch_id for the merged patch. In order to find the detail of the merged patch, we need to look in the AD_PATCH_DRIVERS table, using the APPLIED_PATCH_ID from the AD_APPLIED_PATCHES table. I use bugs/patches because sometimes a bug number will also be the patch name/number. This happens when the bug is not merged with other bugs into a bigger patch and assigned a surrogate number. Patches with surrogate numbers are related to multiple bugs. By joining the queries together, we get a list of all patches and the patch names, even patch names that were assigned by Oracle. Oracle also uses AD Merge Patch to merge patches. (3) payroll regulatory updates for the United States, Canada, United Kingdom, and Australia for fiscal years ending in 2014. 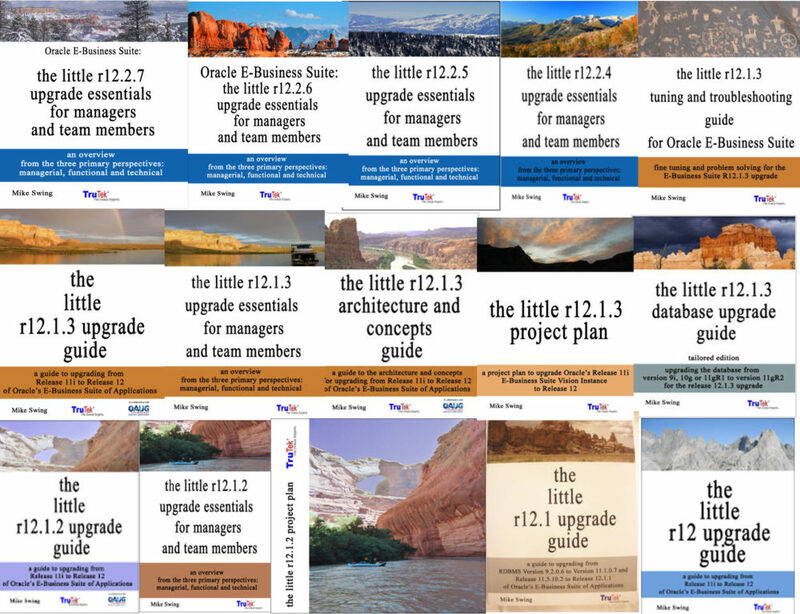 When upgrading to 12.1.1 and then 12.1.3, if you don’t apply patch 5233248 during the application of your 11i patches to prepare your database objects for R12, after the upgrade and all the R12.1.3 patches have been applied, there are three invalid objects that can only be resolved by applying this SLA patch to the 11i instance, in advance of the upgrade to R12.1.3. This patch is recommended as a patch needed if you are using “Upgrade by Request”. There are other methods to implement “Upgrade by Request”, but this is the method we recommend. If you don’t apply this patch and set the start and end dates with the SLA pre-upgrade program shown below, then only the default number of periods will be upgraded. The number of periods that are upgraded by default are six, unless you set the periods in the SLA pre-upgrade program. We highly recommend setting the starting period to the first period in your instance and the ending period to the last period in your instance. If you decide to use less than all the GL periods, the amount of time this saves has been about one to two hours during our customers production upgrades. The post upgrade concurrent request can upgrade any remaining data in a few hours, if you choose not to upgrade all your GL periods during the original production downtime window. But a downtime window for this post upgrade concurrent program should requested because of the amount of archive logging it creates. If you have a downtime window to process the remaining GL periods, archive logging can be disabled. If you do not have a downtime window during the post SLA processing, the archive log mount point can fill up and hang your database. For this reason we strongly recommend disabling archive logging during any post processing of SLA data. My notes for teaching the OCA 11g DBAI class, for students preparing to take the OCA exam. Fails on consistent read- undot for CR has been overwritten ORA-01555 “snapshot too old”. This means the transaction will succeed. All the RMAN command are listed at the bottom. Copy the file(s) to the new location. Turn the tablespace to offline. We could have turned the tablespace offline before the copy, removing the need for a recovery, but the tablespace would have been offline longer using that method. Switch to the new datafile copy(s) and recover the tablespace. Turn the tablespace online again. To move or rename a datafile do the following. Start the database in mount mode. Issue the ALTER DATABASE RENAME FILE command to rename the file within the Oracle dictionary. “@” Run a command file. “@@” Run a command file in the same directory as another command file that is currently running. The @@ command differs from the @ command only when run from within a command file. “ALLOCATE CHANNEL” Establish a channel, which is a connection between RMAN and a database instance. “ALLOCATE CHANNEL FOR MAINTENANCE” Allocate a channel in preparation for issuing maintenance commands such as DELETE. “allocOperandList” A subclause that specifies channel control options such as PARMS and FORMAT. “ALTER DATABASE” Mount or open a database. “archivelogRecordSpecifier” Specify a range of archived redo logs files. “BACKUP” Back up database files, copies of database files, archived logs, or backup sets. “BLOCKRECOVER” Recover an individual data block or set of data blocks within one or more datafiles. “CATALOG” Add information about a datafile copy, archived redo log, or control file copy to the repository. “CHANGE” Mark a backup piece, image copy, or archived redo log as having the status UNAVAILABLE or AVAILABLE; remove the repository record for a backup or copy; override the retention policy for a backup or copy. “completedTimeSpec” Specify a time range during which the backup or copy completed. “CONFIGURE” Configure persistent RMAN settings. These settings apply to all RMAN sessions until explicitly changed or disabled. “CONNECT” Establish a connection between RMAN and a target, auxiliary, or recovery catalog database. “connectStringSpec” Specify the username, password, and net service name for connecting to a target, recovery catalog, or auxiliary database. The connection is necessary to authenticate the user and identify the database. “CONVERT” Converts datafile formats for transporting tablespaces across platforms. “CREATE CATALOG” Create the schema for the recovery catalog. “CREATE SCRIPT” Create a stored script and store it in the recovery catalog. “CROSSCHECK” Determine whether files managed by RMAN, such as archived logs, datafile copies, and backup pieces, still exist on disk or tape. “datafileSpec” Specify a datafile by filename or absolute file number. “DELETE” Delete backups and copies, remove references to them from the recovery catalog, and update their control file records to status DELETED. “DELETE SCRIPT” Delete a stored script from the recovery catalog. “deviceSpecifier” Specify the type of storage device for a backup or copy. “DROP CATALOG” Remove the schema from the recovery catalog. “DROP DATABASE” Deletes the target database from disk and unregisters it. “DUPLICATE” Use backups of the target database to create a duplicate database that you can use for testing purposes or to create a standby database. “EXECUTE SCRIPT” Run an RMAN stored script. “EXIT” Quit the RMAN executable. “fileNameConversionSpec” Specify patterns to transform source to target filenames during BACKUP AS COPY, CONVERT and DUPLICATE. “FLASHBACK” Returns the database to its state at a previous time or SCN. “formatSpec” Specify a filename format for a backup or copy. “HOST” Invoke an operating system command-line subshell from within RMAN or run a specific operating system command. “keepOption” Specify that a backup or copy should or should not be exempt from the current retention policy. “LIST” Produce a detailed listing of backup sets or copies. “listObjList” A subclause used to specify which items will be displayed by the LIST command. “maintQualifier” A subclause used to specify additional options for maintenance commands such as DELETE and CHANGE. “maintSpec” A subclause used to specify the files operated on by maintenance commands such as CHANGE, CROSSCHECK, and DELETE. “obsOperandList” A subclause used to determine which backups and copies are obsolete. “PRINT SCRIPT” Display a stored script. “QUIT” Exit the RMAN executable. “recordSpec” A subclause used to specify which objects the maintenance commands should operate on. “RECOVER” Apply redo logs and incremental backups to datafiles restored from backup or datafile copies, in order to update them to a specified time. “REGISTER” Register the target database in the recovery catalog. “RELEASE CHANNEL” Release a channel that was allocated with an ALLOCATE CHANNEL command. “releaseForMaint” Release a channel allocated with an ALLOCATE CHANNEL FOR MAINTENANCE command. “REPLACE SCRIPT” Replace an existing script stored in the recovery catalog. If the script does not exist, then REPLACE SCRIPT creates it. “REPORT” Perform detailed analyses of the content of the recovery catalog. “RESET DATABASE” Inform RMAN that the SQL statement ALTER DATABASE OPEN RESETLOGS has been executed and that a new incarnation of the target database has been created, or reset the target database to a prior incarnation. “RESTORE” Restore files from backup sets or from disk copies to the default or a new location. “RESYNC” Perform a full resynchronization, which creates a snapshot control file and then copies any new or changed information from that snapshot control file to the recovery catalog. “RUN” Execute a sequence of one or more RMAN commands, which are one or more statements executed within the braces of RUN. “SEND” Send a vendor-specific quoted string to one or more specific channels. “SET” Sets the value of various attributes that affect RMAN behavior for the duration of a RUN block or a session. “SHOW” Displays the current CONFIGURE settings. “SHUTDOWN” Shut down the target database. This command is equivalent to the SQL*Plus SHUTDOWN command. “SPOOL” Write RMAN output to a log file. “SQL” Execute a SQL statement from within Recovery Manager. “STARTUP” Start up the target database. This command is equivalent to the SQL*Plus STARTUP command. “SWITCH” Specify that a datafile copy is now the current datafile, that is, the datafile pointed to by the control file. This command is equivalent to the SQL statement ALTER DATABASE RENAME FILE as it applies to datafiles. “UNREGISTER DATABASE” Unregisters a database from the recovery catalog. “untilClause” A subclause specifying an upper limit by time, SCN, or log sequence number. This clause is usually used to specify the desired point in time for an incomplete recovery. “UPGRADE CATALOG” Upgrade the recovery catalog schema from an older version to the version required by the RMAN executable. “VALIDATE” Examine a backup set and report whether its data is intact. RMAN scans all of the backup pieces in the specified backup sets and looks at the checksums to verify that the contents can be successfully restored. This may indicate that the “END OF COMPLETED JOBS’ line is missing. Notice the patch lists the number of jobs from the beginning of the patch, phase A0, not the current job, in this case is 48177 jobs at phase A144, as shown in the figure at the bottom of this post. Other OTN threads suggest restarting the patch from the beginning. This requires a restore of the database, and while this solution works, it’s not the fastest solution. Please edit the $APPL_TOP/admin/SID/restart/adpmain.rf9 file and remove the last incomplete line. See the figure below, the last line is incomplete compared to the line above it. Make a backup of the restart directory and edit the file and remove the last line. Then, restart the patch and use adctrl to set the jobs to restart. Run adstpall.sh to stop the apps tier and adstrtal.sh to start the apps tier. Notice the next figure shows the first line is the Rapid Install RDBMS Disk2. This is the last disk of the ORACLE_HOME software disks. 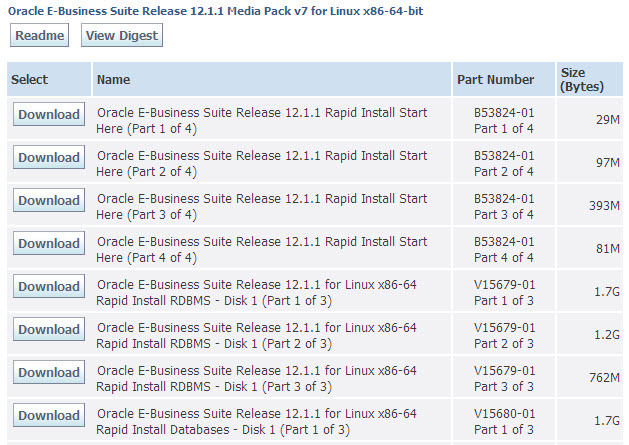 You will need to download this and rapidwiz will ask for these disks, even though you have selected the rapidwiz option to “Upgrade Oracle Applications”. In my case, I already have a 11.2.0.3 ORACLE_HOME, so I don’t need the 11.1.0.7 ORACLE_HOME that gets installed with these disks. However, there is no option other than install all the software. If you remove this ORACLE_HOME before rapidwiz finishes it’s post install checks, the install will fail and the oraInventory will not be updated. Therefore. wait for rapidwiz to completely finish and then delete the 11.1.0.7 ORACLE_HOME. In the figure below. you don’t need to download the Rapid Install Databases disks. These are used if you want install the VISION database with data pre-populated. We are up to our sixth pass and are on our seventh and perhaps last one. The past two times have taken longer than the previous ones (I’m talking like 8-12 hours per on the 12.1 and 12.1.3 patches). Doesn’t seem like a lot but when you only have 72 hours it’s a lot! I think I may know why but wanted to run it by you. We avoided running the statistics steps in order to save some time up front. Thinking about it now, could this end up adding hours to the two main patches? I think yes, it could be huge. We are also looking at the SAN as well but thought I would start here. Yes, statistics can be very helpful. You should run these upfront, adstats. Second, take a look at V$SYSTEM_EVENT, it will tell you what your wait events are. This is cumulative, so stop your database before you start the upgrade and it will refresh the table. Your SAN is probably the biggest problem. Get everyone out of the SAN during the upgrade; you are sharing bandwidth. Also, ask your SAs if they can increase the stripe size for the upgrade. If you can stripe across 8-12 disks during the upgrade and the reduce that after the upgrade. The reason is concurrency. When you run the upgrade with the stripe size going across 12 disks, you’ll light up the whole SAN with the upgrade. Also, spread your mount points across the SAN so that you are using more disks and aren’t using just one or two mount points with a very limited number of disks. If you can light up the whole SAN you’ll have better throughput. However, reduce this after he upgrade, because with multiple users, they will be waiting for each other; waiting for each other’s transactions to complete. Transactions will be very fast with lots of mount points with more disks, but everyone will be waiting. As long as it’s just the upgrade running more disks with more disks in each stripe will improve you IOPS. Also, check your network. You may be waiting on your network. If you have multiple DNS servers, test how long it takes to return an address from all the DNS servers. If you have a bad DNS address, SQLNet will wait 1 minute before trying the next DNS address. For a 3 second SQL transaction, this can be devastating. Use fewer workers if you have poor IO and more workers if you have fast IO. For example, with just a few disks, use the same number of workers (3-4) as you have disks. With a large number of disks use 16 workers. However, this depends on the number of CPUs you have. More workers will help the compile stage. So, use about the same number of workers as you have CPUs, if you have lots of disks. If you have only a few disks, more CPUs and more workers will make the problem worse.